Meet Darshan Gajara, creator of Product Disrupt – a list of resources that made him a Product Designer. We talked with Darshan about different ways people can get into product design and how to keep getting fresh knowledge and inspiration. This is Phase Magazine’s second audio interview (after Design Sprints 2.0.) All episodes are also available on Apple Podcasts! Daniel: Hi Darshan! Tell us a bit about yourself. What are you doing and what’s your story with design? Darshan: Thank you for having me! I’m a Product Designer based in Mumbai, India. I quit my full-time job as a Product Designer two years ago to become a full-time freelancer. I work remotely, so location is not really a problem for me. I went to an engineering college, and ironically that’s how I got into design. While studying computer engineering, I started developing websites. Back in those days I had no idea this was called “design & development,” I thought it’s just developing websites. It was very optimistic of me thinking that some company will come to my university and just offer me a job in design. But I was lucky, and the company called BookMyShow approached me. It’s India’s largest ticketing platform. They were hiring developers, so I first applied for the position in open source development. During the interview, the recruiter told me that after seeing my portfolio they think I’d be a better fit for a design job. I said to him that design was actually what I wanted to do. Eventually, they first hired me as a developer and later moved me to the product design team. I worked in ‘BookMyShow’ for a year. After that, I joined Wishberry.in, where I was hired as a Product Design Leader. That’s how my journey with design started. You’re based in Mumbai, India. How’s the local design ecosystem? Are local designers mostly self-taught or do they go to universities? There are a lot of people who followed a similar path as I did – going to engineering school and learning to design later. The way people usually learn about design is via YouTube or SkillShare. There are a lot of design-centered colleges in India too, but product design is still a pretty new thing here. Indians tend to quickly catch trends from the Western culture. Because design is a huge thing in Western countries, it’s slowly coming to India. I’d say that it has already arrived, but you don’t see an established market for it yet. That’s why it’s always tricky to reasonably price your job as a Product Designer. 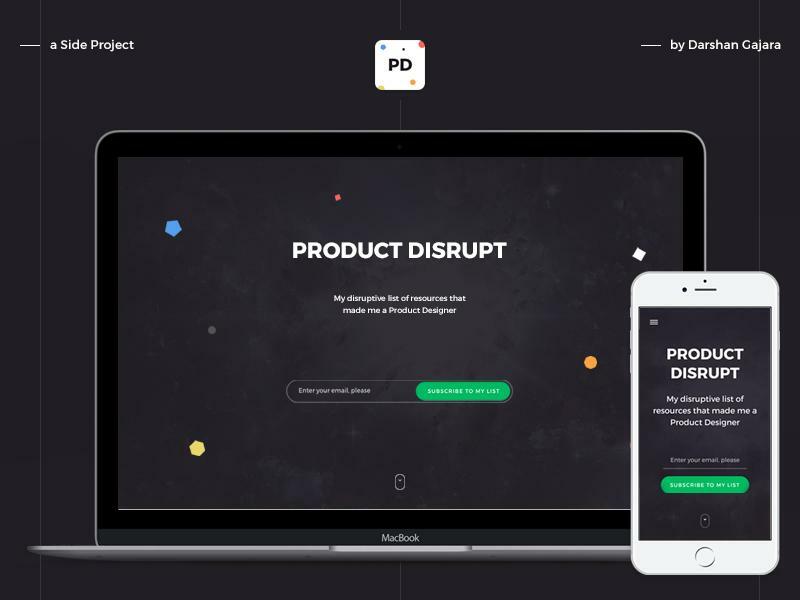 Your design education website is called Product Disrupt. Can you explain what its goal is and who is it for? I learned to design from the internet, and I like to call myself an internet-made designer. I always wanted to learn from the best-of-the-best, and I was able to find them online. There are many brilliant designers writing blogs, producing newsletters, and sharing their stories and design processes. That’s a lot that you can learn from. So I subscribed to many newsletters and studied them on a daily basis. I also followed many designers to see how they work and implement their workflows in my own process. Not a lot of my friends knew what ‘design’ is, and they kept asking me questions like ‘What is it that you do in your day job?’, ‘What does Product Design actually mean?’ There were also other people reaching out to me and willing to learn about Product Design. So I thought, why not make that list of resources that I’ve already got public? 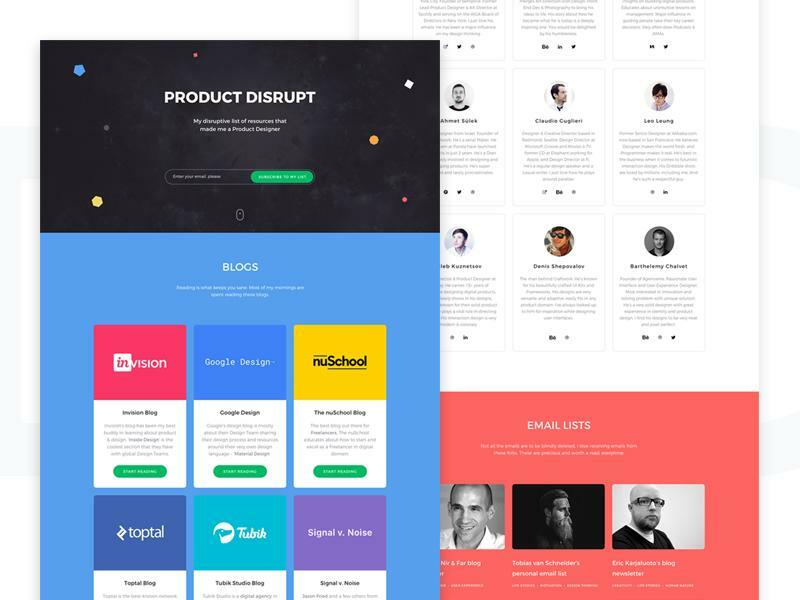 I put together a website called ‘Product Disrupt’ and listed all the resources there. So whenever someone wants to learn product design from the internet, they can start with my website. I’d say it’s a hand-picked and curated list of resources to learn product design. It’s not just for those who are getting started with design, though. Even if you’re deep into your design learning, you can still look at those resources and find something interesting and useful for you. What are the best resources for digital designers now? There are a lot of great publications on Medium that keep on posting design-related articles. There’s also Smashing Magazine and Ueno – a digital design agency. You can even reach out to them, and if they really like your question, they will cover it in a column called Dear Ueno. You can also go to Facebook and Slack groups. There’s one particular Facebook Group that I’d like to give a shout out to – Designers Guild. It’s really diverse and has people from around the world working in different companies and industries. 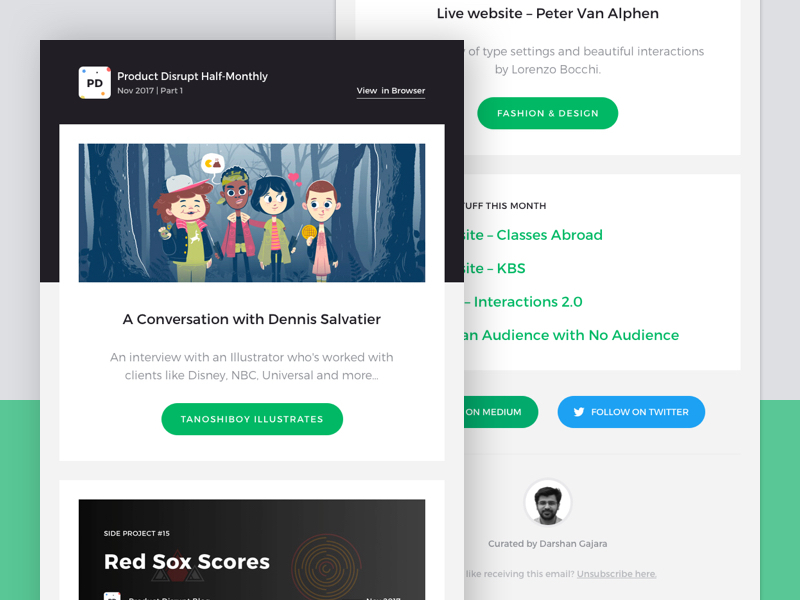 There is also a Slack Group called Freelance.tv, where designers share different things. How accessible are resources for designers? What can be improved in that area? It’s all over the place right now. When you see all those resources, you can get really confused what to pick and how to start. What can be helpful for you is going to websites that curate the content. On Product Disrupt, I don’t want to bombard people with content. I’m only sharing things that were useful for myself and helped me become a better designer. Curation is one of the best solutions to organize all of the resources available on the Internet. What’s missing in digital design education now? Mentorship. It’s really important to get the basics right when you’re starting. If in the beginning you have been misguided or got something wrong, it will always be difficult for you. Consistent mentorship is one thing that could really improve the design community. How are digital design tutorials and resources different to print design? Resources for digital design are more practical. You can just study them and then right away incorporate into the project you are working on. Whatever you’re looking for, whatever technology you want to learn – it’s all out there. All of those resources are also really fresh so that you can apply them to your projects fast. You cannot really do the same thing with print. Where are we heading concerning design tools? What new design approaches will we see in upcoming months? That’s one of the returning questions nowadays. There are many existing tools and new companies coming up with new solutions. The competition is always healthy for the market. With the direction most of those new tools are taking, it’s now effortless for anyone to start using a new app. There are also a lot of free resources out there, like UI kits, so you can start designing right away. Interaction design also became way easier than it used to be with After Effects. Designing is getting really easy and fun, but your role as a designer is still going to be important. You will be more focused on creating the end-to-end experience for users and solving core issues. You’ll be actually able to address those things with the power of new tools. It’s no longer just about visual design – it’s about creating the whole experience. With UX, you always get new problems, and as a designer, you have to think of solutions to them. How you stay up-to-date with current trends in design? I subscribe to newsletters like Dense Discovery. I’m also a Young Jury of Awwwards, so every day I go to my judge’s panel, where I get a lot of curated content and inspiration. I keep an eye on trends and new websites showing up. Apart from that, I usually check Dribbble and Behance. Whenever I find something interesting, I just save it to my Bucket or Collection so that I can share it later. Is following design trends becoming harder with all of the different platforms where designers can share their work? It definitely is. This is when the curation becomes important. If you follow one resource that hand-picks other resources for you, you don’t have to follow the other ones. Even now, I subscribe to Codrop’s Collective, where they share great resources. So I don’t have to keep track of thousands of websites to be up-to-date with current trends. It’s beneficial to stick to curated content rather than going to all of those places by yourself. What makes design influencers truly influential? Those influencers are very consistent in what they do. They’ve been working on their craft for years, and they have owned that craft since day one. They’re not afraid of putting their work out to the public. They get a lot of feedback from that, and they’re constantly learning. If you want to influence someone, the consistency is a key. Imagine if you’ve seen a good project, went to author’s profile and followed him/her. But for months there’s no new content. It was just one project. You don’t want to follow someone like that. You want someone who will continuously provide you value. Are design influencers obligated to produce educational content for the new generation of designers? The one thing that can keep people glued to an influencer is entertainment. It’s not always education. You can take for an example, Pablo Stanley. Most of the time he is creating beautiful side projects, but sometimes he is also making a funny comic series. That keeps people glued regardless of which content he produces. You can think of this person as someone who you would like to hang out with. Not only is he/she serious, but also fun. So obviously, if you have a lot of influence in the design community, you should take the responsibility and give back to the community. How is it possible that such busy people find time to create Side Projects? There are a lot of things that they want to do just for fun, or they are very passionate about – they will always find time for it. They will work on those side project after hours or on the weekends. It’s not impossible. You always find time for things that really matter to you. What tips do you have for someone who is just getting started with Product Design? Talent can always provide you a head start, and you might be ahead of other people at the beginning. But if you don’t put enough work into it, you’re always going to be left behind by the other, more hard-working and determined, people. Be consistent. Don’t just give up on things. Keep on putting your heart into it. If you want to have a better body, you have to have a training routine. The same thing applies to being a better designer. Thank you for the interview, Darshan! Be sure to check out Product Disrupt and Product Disrupt Newsletter. Also, you’re welcome to support his input to the design community on Patreon.